It has been the time of the honey “recolte” in France. Even though the three hives at Moulin de Larcy are about one and half meters away from one another, each year each hive is so different from its neighbour as regards the amount of bees and honey. This year two out of the three hives were extremely calm and not at all fussed that I was robbing them of a great deal of their honey – the third hive made up for the other two with their aggression. All in all we now have 72 bottles of honey from the hives this year, thanks to our busy bees. The honey is amazing, I put this down to the fact that, unlike the majority of beekeepers, I do not give our bees beet sugar over winter, they have their own honey – this is a time when they really need to draw on their immune system,and require all the nourishment possible (what could be more nourishing than their very own honey). I also let the bees be bees and disturb them as little as possible, thereby causing the minimum of stress to the colony. 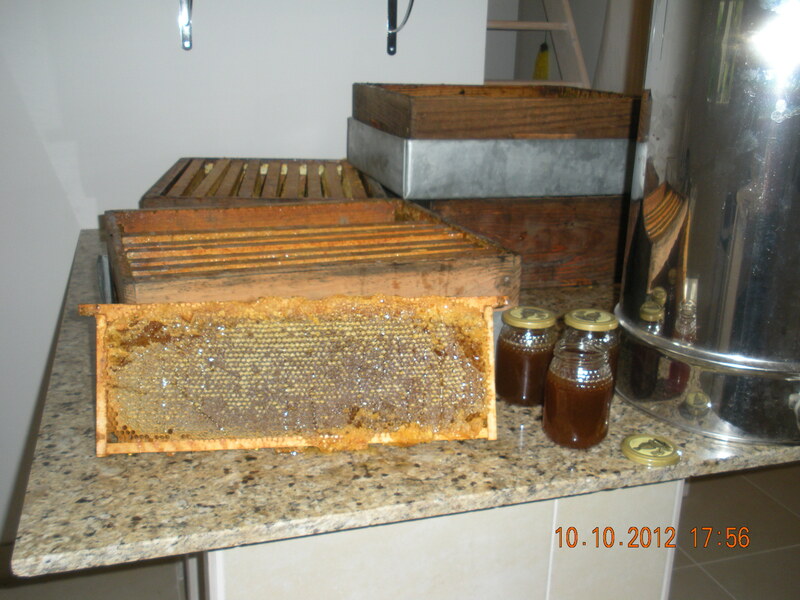 They are happy bees and produce delicious honey – everyone who tastes the honey from Moulin de Larcy comments on how “amazing” it tastes compared to other honey. Well-being message: An American man who had reached his 100th birthday was asked the secret to his good age and good health – a teaspoon of honey every morning! This entry was posted in Executive Stress Management, Food & Wine, Healing, Holiday, No children, Organic, Peace & tranquility, Spiritual retreat, Well-Being and tagged food, health, organic, peace. Bookmark the permalink.